Chris, now 65 and recently retired after 24 years in the machine room of the Liverpool Echo, started his fight career at St. Sylvester’s with hit brother Tony. “Tony won the 5st 7lbs Northern Counties schools title we moved on to St. Malachy’s, where he picked up the Lancs & Cheshire 6st 7lbs title, also the Northern Counties championships at 7st 7lbs and 8st 6lbs. When in the Forces, he was Army professional lightweight champion. 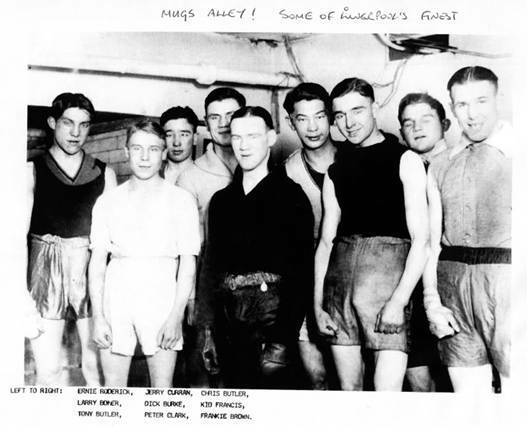 “At St. Malachy’s I benefited from sparring with such men as Ginger Foran and Jimmy Stewart, reaching the Northern Counties flyweight final, where I lost to Jacky Rees, the reigning champion, after putting him down twice. Rees went on to lose to Liverpool’s Johnny Peers in the final but I reckon Johnny owed me a debt for softening Rees for him. I was 22 before I turned professional in 1932 and looking back on my car would say it was by debut as a pro that gave me my biggest thrill. I was put in with Matt Stewart (Birkenhead) at St. Martin’s Hall. Stewart had just lost to Ginger Foran, which was no disgrace, and he was giving me a hammering until I caught him flush on the jaw in the sixth and knocked him out. I met Matt three times, knocking him out twice and also outpointed him. I followed this up by knocking out Young Boyd (Birkenhead) in two, stopped Johnny Kendricks in four, knocked out Peter Banasko in one and KO’d Paddy McGuire in two. Peter Banasko was a clubmate at Malachy’s and was the first Liverpool boxer to win a National Schools’ title. Just after he was champion, we met on a show in Wakefield and I caused a real upset when I outpointed him. I did even better when we met professionals. It was at the Stadium and was Peter’s debut, but I spoiled everything by knocking him out in the first. “As you can see, I had made a very good start but after this, I was rarely matched with flyweights. I never had a manager, though Tony Vairo handled my affairs for quite a while when I trained at Transport House. I trained under Billy Metcalfe, Charlie Phillips and Peter Marnick at various times, sparred with Ginger Foran when he prepared for his battle with Jackie Brown and with Peter Kane prior to his title date with Benny Lynch.. I also sparred with Dom Volante, Nel Tarleton, Joe Curran and the American world champion Freddie Miller. “I beat George Saunderson on a top of the bill fight at Chester for which I recieved just five shillings, beat Earlestown’s Titch Hamilton and lost on a disqualification for holding against Eddie O’Ryan when I reckon he was g the holding after I had dropped him. One of my worst moments was when I suffered a bad knock-out at the hands of Young Stenson at the Ike Bradley was in the corner and had spilled a bucket of water which I slipped on. As I went over, Stenson caught me and I was out cold for half an hour. My last fight was in 1942 when I was home on leave from the RAF. I was 32 at the time and had been out of training for a couple of years. There was a show at Blackpool promoted by Johnny Best and I went along spectator only to be roped in as a substitute. I can’t even remember my opponent’s name but thought it was easy after dropping him in each of the first two rounds. My legs went at this time, and he came back at me. We were up and down in a great battle, drew a shower of nobbins but I finished on points with two black eyes and walking round in a trance. I got £2 10s and for my trouble an needed an eye operation not long afterwards.